The Chinese Communist regime has used prisons, labor camps, brainwashing centres, and other facilities to detain Falun Gong practitioners since it launched a nationwide campaign against Falun Gong in July 1999. Falun Gong, also known as Falun Dafa, is a spiritual discipline and meditation practice based on the principles of Truthfulness-Compassion-Forbearance. Many practitioners in China have been arrested in the past two decades for refusing to renounce Falun Gong. The formal prison system is used to incarcerate Falun Gong practitioners who have been convicted for upholding their faith after trial. There were 681 prisons across China as of 2012, according to a report by China’s Ministry of Justice. It is worth noting that China’s court system has served as a rubber stamp in the persecution of Falun Gong: it merely goes through the motions to put on show trials before delivering predetermined sentences against practitioners. The now-defunct labor camp system allowed authorities to detain practitioners for up to 4 years without trial. In a 2009 UN Human Rights Council report, the Chinese delegation described its system of re-education through labor as “similar to that of correctional service in other countries” that was “applied to persons who have committed crimes that do not warrant criminal sentence.” The report estimated that there were 320 labor camps holding 190,000 people across the country. As labor camps were often used to detain prisoners of conscience who had not committed any crimes, the Chinese regime faced mounting pressure from the international community and shut down the system in late 2013. The detention of Falun Gong practitioners didn’t disappear, however, as the regime has since intensified the use of extrajudicial brainwashing centers instead. Unlike prisons and labor camps, brainwashing centres are not established based on any laws or regulations. The 610 Office, an extralegal agency established by the Communist Party leadership on June 10, 1999 and tasked with carrying out the persecution of Falun Gong, has sole discretion in setting up brainwashing centres, which can detain practitioners indefinitely. Under the directive of the 610 Office, every level of government, neighborhood committees, businesses, and even schools can set up brainwashing centres anywhere they want, even in hotels or private residences, without following any legal procedures. It is thus difficult to ascertain the exact number of brainwashing centres, nor is there an official tally. Though extrajudicial and extralegal in nature, brainwashing centres have been well-funded by the government as it attempts to force Falun Gong practitioners to renounce their faith, often through torture. Many law enforcement officers, employers, and residential communities have been incentivized to set up their own brainwashing centers or send practitioners to existing centers. The massive network of brainwashing centres has become a critical component of the Chinese regime’s multi-pillar system to detain Falun Gong practitioners. This report discusses its scale, severity, and devastation. A keyword search of Minghui.org articles from 1999 to 2019 returned about 65,000 articles, in which the words “brainwashing centre” appeared more than 210,000 times in total. After removing those brainwashing centres without exact locations and consolidating redundant entries with varied names, we estimate that there are about 3,640 such establishments across China. These confirmed brainwashing centres were distributed across 30 provincial-level administrative units, including 26 provinces and 4 centrally-controlled municipalities (Beijing, Tianjin, Shanghai, Chongqing). Hebei Province reported the most brainwashing centres (439), followed by Shandong (383), Hubei (336), Sichuan (301), and Jilin (272). 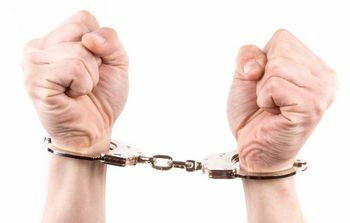 Eight other administrative units also reported triple-digit brainwashing centres, while 15 units had double-digit numbers. Qinghai and Ningxia were the only provinces with fewer than ten brainwashing centres reported. The real number could be much higher, given the censorship and persecution that continues in China. Furthermore, with the labor camp system abolished in 2013, many practitioners have been redirected to prisons and brainwashing centres, both existing ones or those newly launched. While brainwashing centres are initiated by different levels of the 610 Office, they are largely driven by financial incentives and partially funded by money paid by employers or extorted from practitioners. 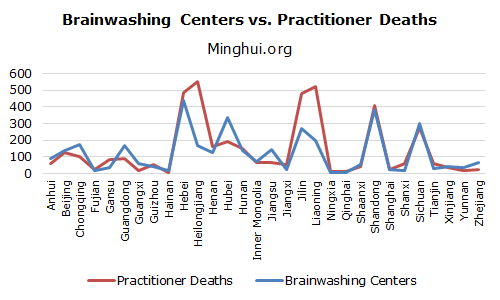 Based on data from numerous sources, Minghui published a white paper in 2014 on the scale of brainwashing centers. “We estimate that over the past fifteen years, fees charged to detainees’ employers totaled approximately 3.37 billion yuan. Government incentives for each ‘successfully transformed’ detainee brought in a further 226 million yuan. This is in addition to government appropriations of an estimated 1.18 billion yuan dedicated to the construction and remodeling of brainwashing facilities,” wrote the report. While prisons and labor camps existed prior to the persecution of Falun Gong, brainwashing centres are unique in that their sole purpose is to force practitioners to forsake their belief. To achieve this goal, brainwashing centers often have the following characteristics. As incarceration at brainwashing centres doesn’t require any legal procedures, practitioners could be detained as long as they don’t renounce their faith. Ms. Li Xihui, a former employee at Sichuan Radio Station, was arrested in 2006 and detained at Xinjin Brainwashing Centre in Chengdu City, Sichuan Province, for seven years. The authorities secretly transferred her to Er’ehu Brainwashing Centre in Ziyang City in 2013 and continued to brainwash her. It wasn’t clear whether she has been released at the time of writing. Another practitioner in Guangdong Province, Ms. Xie Yu, 32, was taken to a brainwashing centre in January 2019, right after she finished serving two years in prison for distributing Falun Gong materials. Her family learned that the authorities decided to send her to the brainwashing centre because she still refused to renounce her faith upon finishing the prison term. The extrajudicial nature of brainwashing centres makes their operation highly arbitrary and secretive. For instance, after the labor camp system was abolished in 2013, many brainwashing centres in Wuhan City, Hubei Province, removed visible signs and logos on the facilities to avoid traceability and liability. Occasionally, some facilities were closed while new ones were launched elsewhere to continue brainwashing of the practitioners. One practitioner in Hubei Province was arrested in October 2018 for not renouncing her faith. After she was detained for 15 days, the police took her directly to a mental hospital and kept her there for five days before moving her to a secret brainwashing centre. The officers covered her head with a black hood and tied her hands during the transfer so she didn’t know where she was taken. Her family learned of her whereabouts and went to the secret brainwashing centre. Before they got close to the door, they heard an automated voice: “Do not approach. Lasers are being activated.” Lasers suddenly came from all directions and surrounded them. The lights followed them as they moved, eventually forcing them to leave. Then her family found another place, which was an abandoned residence with no signs or door plates. The metal door was closed. No one answered as they called the practitioner’s name. The practitioner later told her family after she was released that she was in the second location when they went there. The staff became nervous when they heard her family. They didn’t allow her to make any sounds or signal to her family that she was being kept there, as it was a secret location the authorities didn’t want to be exposed. In addition to torture and around-the-clock monitoring, the forcible administration of unknown drugs is also common in brainwashing centres. Mr. Xie Deqing, a healthy retiree, died about 20 days into his detention at Xinjin Brainwashing Centre in Chengdu City, Sichuan Province. He was emaciated, incontinent, and in extreme pain before his death. His skin was grayish. These symptoms were consistent with those of other practitioners who had been confirmed to have been given unknown drugs. Over 100 police officers were later dispatched to forcibly take his body from the funeral at midnight for cremation. 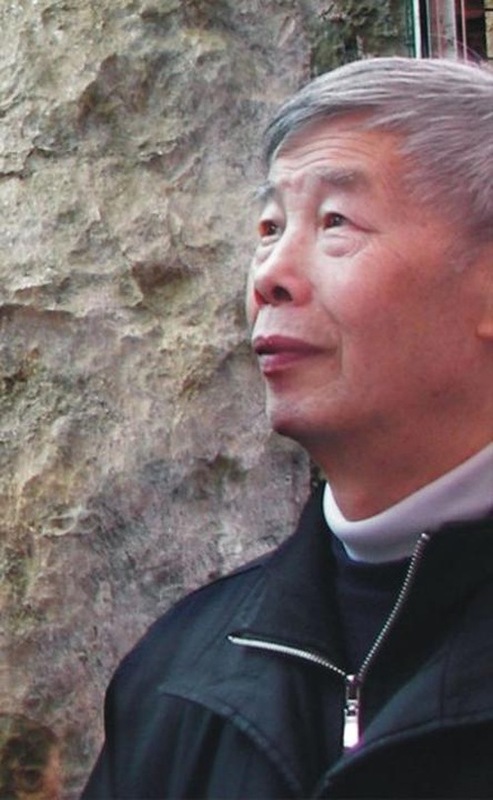 Mr. Xie Deqing died of suspected administration of unknown drugs. Besides physical confinement, practitioners are also forced to watch propaganda videos slandering Falun Gong and write down their thoughts afterward. Their written reports are often analysed by psychologists, who then take advantage of any weaknesses discovered to devise new strategies to destroy their faith. Very often, coworkers and family members are called in to coerce practitioners to give up their belief. At the brainwashing centres in Wuhan City, Hubei Province, the authorities installed three cameras in each room. Paper slips printed with sentences defaming Falun Gong were posted on the tables, chairs, and floor. As long as it was not sleeping time, the television in the room must be on and playing either programs directly defaming Falun Gong or other programs aimed at weakening practitioners’ willpower. The practitioners were also prohibited from doing the Falun Gong exercises. The guards also set strict physical restrictions for them, such as limiting the time to finish a meal and where and how they washed their dishes. Ms. Dai Juzhen developed medical conditions three days after she was taken to Haikou Brainwashing Centre in Wuhan City on August 9, 2018. Another distinctive aspect of brainwashing centres is their disguise. These places are often referred to as “legal education centres.” Officials also deceive family members who do not support Falun Gong into helping convince practitioners to go. This happened to Ms. Tang Xiaoyan in Guilin City, Guangxi Autonomous Region: Her family believed the 610 Office that the center was a favorable, voluntary study place. But once Ms. Tang arrived there, officials beat her, tortured her, kept a bright light in front of her eyes at all times, and deprived her of sleep and water. This led to life-threatening conditions for Ms. Tang on at least two occasions. The physical and mental abuse at brainwashing centres also contributed to deaths of Falun Gong practitioners. According to available data, among the 3,653 confirmed death cases of Falun Gong practitioners between 1999 and 2014, 746 (20.4%) were tortured in brainwashing centres, and 367 (10%) deaths took place there. Ms. Xu Huizhu, a retired teacher in Guangdong Province, was arrested in late July 2016 and taken to Huangpu Brainwashing Centre. She died in August shortly after she was released. Another practitioner detained at the same facility, 72-year-old Ms. Wu Yangzhen, was forced to stand still for 7 hours. This and other physical abuse led to Ms. Wu’s blindness. As one of many types of facilities used to detain Falun Gong practitioners, brainwashing centres offer a glimpse into the devastation of the persecution of Falun Gong practitioners in China. While we do not have data on how many practitioners have been detained in brainwashing centres, we observe a largely positive correlation between the number of brainwashing centres and the number of deaths in various regions. According to data compiled by Minghui.org, a total of 4,288 practitioners have been confirmed to have died as a result of the persecution of Falun Gong. These deaths are distributed all across China, and provinces with more deaths also have more brainwashing centres. Even though we cannot draw definitive conclusions regarding how brainwashing centres have contributed to the deaths of Falun Gong practitioners, the positive correlation at least validates the role of brainwashing centres in the persecution of Falun Gong. Although the persecution directly targets Falun Gong practitioners and their belief in Truthfulness-Compassion-Forbearance, the loss extends beyond practitioners and their families. The entire society is negatively impacted when those who pursue moral and spiritual improvement are discouraged from doing so. Even perpetrators in the persecution have also become victims as they face consequences for their actions. During a screening of Letter from Masanjia, a documentary about Falun Gong practitioners’ suffering at the notorious Masanjia Labor Camp, at the University of Delaware, several practitioners testified about their personal experience of detention and torture during a panel discussion following the screening. One audience member asked if they hated the officials who persecuted them. Data show that a large number of officials and police officers involved in the persecution have died at relatively young ages. The causes of deaths ranged from traffic accidents to suicides to incurable illnesses. While the deaths appear accidental, many Falun Gong practitioners and their families and supporters believe that the perpetrators have received karmic retribution. According to traditional Chinese culture, good and bad deeds are rewarded accordingly. About 20,000 such deaths have been reported to Minghui.org between 1999 and 2019, during which time tens of millions of practitioners have been persecuted for their faith. The following chart shows a close correlation between the number of brainwashing centres and the number of retribution cases in different regions. Again, we caution that brainwashing centres are only part of the story, as many perpetrators work in prisons and labor camps. Nevertheless, such close correlation shows the deep involvement of brainwashing centers in the persecution of Falun Gong practitioners.